I have various processes for pie-some complex following The Pie Bible directions, and some more laid bake like my mother's simple crisco-crust apple pie. When we vacation in Michigan, the fruit just calls my inner baking goddess to bake pies, muffins, breads and cobblers. The fruit here is outstanding. The peaches at the local stands are delicious just by themselves, but add them to a buttery pie and you have heaven. The piebelow includes a basic crust for the most part, but follows a few of The Pie Bible's tips with the crust. The key to flaky crusts is to keep everything cold. That means to use ice in your water and chilled butter (The Pie Bible even suggests freezing half of the butter and the flour mixture), and to not handle thedough with your hands that much. In fact, try not to handle the dough extensively at all. I like The Pie Bible's instructions. From it, I make very delicious pies, albeit tedious to make. But hey-when on vacation (in Michigan) I take a more laid back approach to the pies I make. After all, I'm here to relax!Oh, by the way, if your area is like Illinois, you have crappy fruit. This frustrates me a great deal (see yesterday's post). 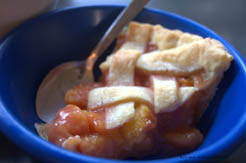 Peach pie is best with fresh, farm-stand peaches. If your peaches are under ripe and you REALLY want to make a peach pie, put the peaches in a brown paper bag on the counter for a day or two. That should help ripen them. Also, when it comes to macerating them for the filling, let them sit in the sugar a little longer to soften up. Enjoy the recipe! In a small bowl, mix 2 Tbsp. ice water, 2 Tbsp. beaten egg (reserve the rest in the fridge for brushing the crust) and vinegar. Add this to your dry mixture gradually, using the back of a fork to combine and push around until moist clumps form. (Vinegar makes the gluten relax and ice water is key here. Also, do not overwork.) When the moist clumps form, quickly use your hand to roughly form two balls, one slightly larger than the other. Cover them with saran wrap and while in saran, quickly flatten andshape them into round discs. Place in the refrigerator for at-least 1 hour or up to 1 day. Now roll out your top piece in the same fashion. When rolled out to the size needed, cut strips of dough for your lattice. 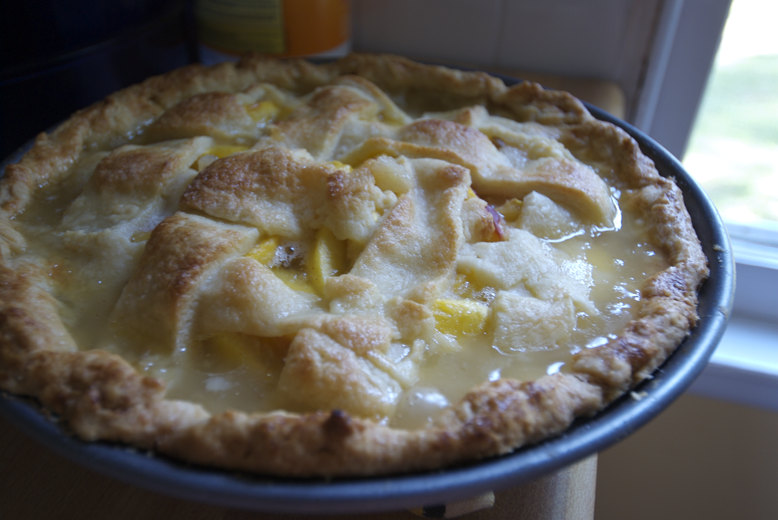 I like a thicker lattice for peach pie, so I cut about 1" pieces so I get 8 strips. You can cut them thinner so that you get 12 strips. This will make a more intricate top. After strips are cut, wrap in saran again and place in the fridge until ready to assemble. Now, prepare the filling. First preheat the oven to 425˚. Then, peel, pit and slice the peaches and put in a large bowl. Sprinkle with lemon juice and toss, then set aside. Take out your lattice dough and let it sit to soften slightly while you finish the filling. In a smaller bowl stir together flour, sugar, salt, nutmeg and cinnamon. Add to the peaches and toss to combine. Take your bottom crust in the pan out of the fridge and pile the fruit in the middle. Dot the filling with the remaining butter. Now make the top. Starting with your longer dough strips, make a cross in the middle of your pie. Because I used 8 strips (4 and 4) I start a little off center to make things look even. I place the next strip next to one, lifting the one over it to slide the strip I am placing under. I continue this way, over/under, gently lifting the strip before it and eye-balling even placement until all strips are placed. With the overhanging dough, crimp under with the bottom overhang. Then go around the entire pie edge with your fingers for a pretty, even scallop. Brush the top with the remaining beaten egg and sprinkle liberally with sugar. At this point, if you have time, I would refrigerate it one more time for 30 minutes to let the dough relax again. Or you could just get it baking. The pie in the photos I went right to baking and as you can see it did not do any shrinking. Bake for 20-25 minutes at 425˚. Then "tent" the pie with tinfoil while lowering the temp to 350˚. Continue baking until juices are bubbling and the top is brown, about 25-35 minutes longer. ("tenting" the pie slows down the browning of the crust, which you do quickly at the beginning at the high temp. This prevents soggy crusts. Make sure to include a steam hole in the foil, or you WILL get a soggy crust.) Let sit for 30 minutes to cool before serving. Serve with vanilla whipped cream. Mix ingredients and beat on high until stiff peaks form.